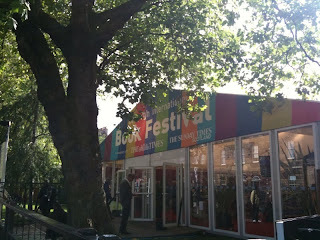 Today, the Edinburgh International Book Festival ends. Many of you were there, either in the Yurt of all Yurts, or else (if you were lucky) reclining in glorious sunshine, eating ice-creams and watching the booky world go by, or (if you were unlucky) suddenly finding yourself stranded in a sea of mud. It's been a record-breaking year. I don't know all the figures yet but I know that the first day saw record footfall (over 15,000 pairs of feet); the first weekend saw record book-sales; similarly ground-breaking figures for ticket-sales and, incredibly for a recession, a 10% increase in sponsorship. 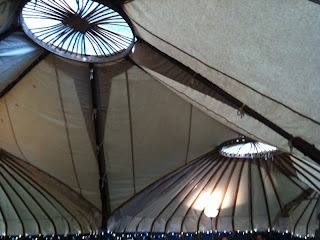 The Yurt (or Yogurt) is a strange place of peculiar smells and unpredictable experiences. It can make any author feel either unexpectedly important or shatteringly small and worthless. You see people you've only seen on the telly, and you find yourself sharing a drink with them or explaining where the Highland Park is hidden; you experience your navel being gazed at by a politician wanting to see if you're a name worth talking to, or you could all too easily trip over a carpet and find yourself on the lap of your literary hero. In case you haven't been, here are a few images, carefully taken with no identifiable people. Below is the hospitality table with, remarkably, no one there. It took me a very long time to catch that. Each year, the Yurtish smells bring back memories of other years. First thing in the morning, when the thin sun slices through the opening, you can imagine that the staff slept there, wrapped in yak blankets, and then unwrapped themselves and washed their faces in dew just in time for the appearance of the earliest authors - did you, Roland? Oisin? Lois? As the day wears on, it's essence of coffee and Highland Park, chocolate brownies and goats' cheese wraps, ground into the carpets by shoes of all descriptions. (Including mine, which have achieved a reputation for pointiness and getting caught in carpets.) And in the evenings the woodchip burning stove is lit and it's the dry sweet pininess of a sauna. As the night draws closer, more Highland Park, more wine, more wine, more Highland Park. And the rising laughter muffled in the folds of the roof, disappearing like the smoke from a Mongolian fire. 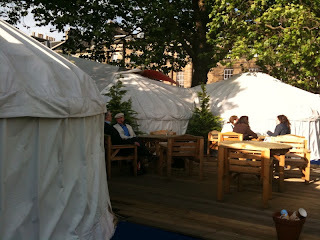 One author told me yesterday of how he couldn't enter the Yurt when he arrived this year. Panic swept over him as he contemplated, remembered, envisaged the sounds of bursting egos. Like a child at a party who is so afraid of the balloon as it is blown up that he puts his hands over his ears and runs from the room. Others love it. 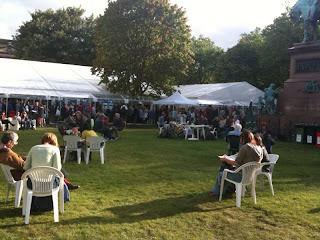 Love the possibility of meeting just anyone, of being on a level with the biggest names in literature. I have loved it and hated it but I go there in anticipation every time. My favourite moment (not this year) was of meeting Michel Faber and feeling suddenly compelled to do that fan thing. "Excuse me," I said, "I just have to tell you that I adored The Crimson Petal and the White. And as for Under the Skin ..."
And he knelt at my feet ... Sorry, I have to say that again. HE knelt at MY feet. Red trousers he was wearing, and his eyelashes pale and soft and his face open. I asked him what he was writing now and he said he couldn't write at all any more, that his creativity had been damaged by his horror at the Iraq War (as I say, not this year) and he didn't think he could ever write again. "I just loved your book." 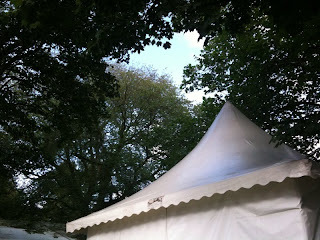 That's what book festivals, all of them, are about. Just loving books and having moments of magic when readers meet authors and the connection is story, words, imagination, truth. There's one thing I know is magic (and if you believe otherwise, please stay silent): the disappearance of the Yurt into thin air when the festival is over. Because of course it's not stored in some dull lock-up somewhere. It couldn't be. And obviously it can't be used by anyone else. Besides, you can't just fold away miles of canvas that has soaked up the hopes and fears and dreams and passions of 750 writers and several bottles of whisky and wine; you just can't. It has a soul: you can't wrap that up. It disappears, I know it does. You wake up the next day and it's just not there, only a pale patch of grass that is far too small to have held so much. But it will be back, next year, by magic again. Meanwhile, it is nowhere. Or at least not in this world. Ooh, Nicola, you took me right back there. I must add a mention of the crayfish wraps, though. By the way the yurt is folded up and stored in an old brass lamp and is brought out with a quick rub of a duster each August. At least that's what I hear. Those are the very shoes we didn't catch 'on film', Nicola. Thank you. Didn't mention the toilets. Or os that your next installment? Lee - glad I have almost inspired you! Gillian - oh, thank goodness. I knew there was an appropriate explanation. Beautiful, Nicola, and spot on in highlighting the way it manages simultaneously to make us feel as special as the celebs we're sharing the air with and as shy as the humblest of stammering fans. I envy the face to face (or face to knee) meeting with Michel Faber. I could only write to tell him how wonderful his Crimson Petal and the White was. Nice shoes. And your posting made me feel I had reached Xanadu - a magic land, an oasis, if you like, on the Mongolian steppes, filled with laughter, congenial company and the joy of kindred spirits. All reached after a long time in the arid central Asian plains. You captured it all so well, Nicola. Today was the school's Gala day - general public not allowed - when the entire place is turned over to a chatter (is that the collective noun?) of children - all so excited to be there. 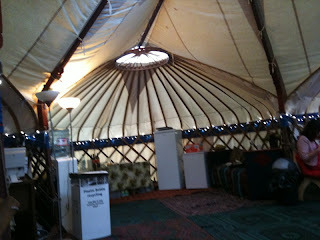 The yurt was quieter than it has been of late as if it was preparing to hibernate. All of a sudden it is over and we will have to wait a whole year for it to begin again. loved this lovely piece of writing, Nicola...it is a very wonderful Yurt and I had my last piece of quiche there this afternoon. Roll on next year! I too experienced the knee numbing sensation of meeting Michel Faber, not in the Yurt though......Ferguslie Park Library! Thank you, all - glad it resonated. It's such an amazing place and even though I've been too tired and busy to enjoy it properly this year, I want it back again! Nicola, thanks for that post. Loved it. Gives me something to aim for. A beautiful post Nicola... it took me right back to Mongolia. Good that you didn't have to eat Yak meat stew though! 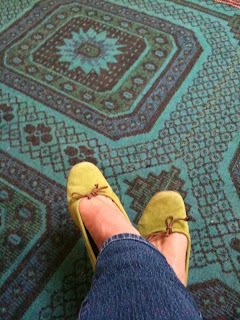 The photographs of the roof were wonderful as were your shoes against that carpet! 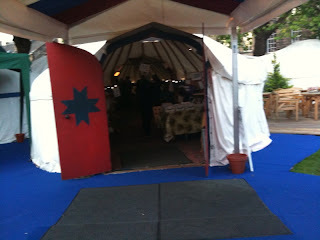 I love how you recapture the smells of the yurt - and how cool is it that there's actually a *yurt*! I think it's one of those things I'd be scared to enter - exactly like you're crashing into a party uninvited. It does sound like it's worth it once you're in, though.